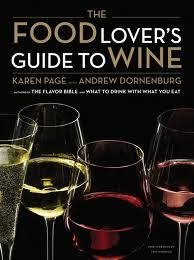 Now there are some dandy food-wine matchmaking works: Evan Goldstein’s “Perfect Pairings,” Karen MacNeil’s “Wine, Food & Friends” and Andrea Immer Robinson’s “Everyday Dining With Wine.” But Dorenburg and Page covered pretty much all beverages, mainly focusing on those with some alcohol. Well now they’ve done it again. “The Food Lover’s Guide to Wine” is an eminently fitting followup to “What to Eat With What You Drink,” somehow expanding on something that already seemed complete. The focus this time is on wine, and thoroughly so. 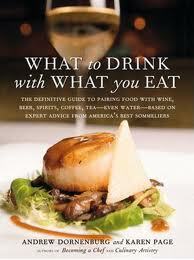 The authors look at scores of grapes and make recommendations not only for dishes but for wine brands. The book, like its predecessor, is layered with tons of tidbits, charts and sidebars featuring statistics and advice from other experts. And again like “What to Eat,” it’s remarkably practical; a reader of any expertise level on food or wine will never feel intimidated nor “talked down to.” It doesn’t just make you feel like an insider; it makes you an insider. Both these books are meant for the kitchen, of course, but also are well-suited for the bedroom or bathroom, because you can pick them up, turn randomly to any section, and dive right in. Deciding which of these is more deserving of the title “indispensable” is almost impossible. I can’t imagine doing without either.